Howard Farrant was a manager of Confederation Life Assurance Company. He lived at 1102 Gilford Street from 1919 to 1938. Howard was born in Mitchell, Perth County, Ontario, on April 14, 1881. His father was William Farrant 1852 or 1853-after 1915), who was born in Tooting, England. William was a hotel keeper in 1878. In 1906, he was a painter. Howard’s mother was Olga Clara Hahndorf (1857 or 1858 – 1915), who was born in New York State. After Howard finished school in Mitchell, he went to University College in Toronto, Ontario. He worked for a time as a reporter for the Philadelphia Record, In Philadelphia, Pennsylvania, and later worked in Toronto as the managing editor for Hugh C. Maclean Ltd., a trade publishing company. In 1908, he arrived in Vancouver. 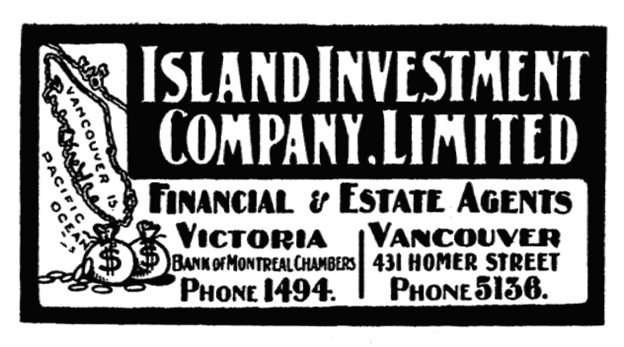 By 1910, he was living at 2335 Yew Street, and he was the branch manager of the Island Investment Company. 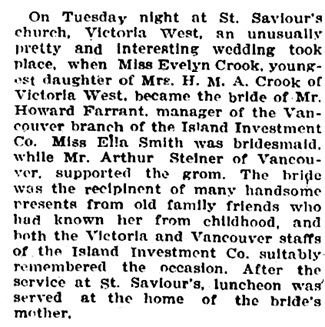 On February 21, 1911, in Victoria, British Columbia, Howard married Gertrude Evelyn Maud Crook (often called “Evelyn”). Evelyn was born on February 6, 1883, in Moodyville, British Columbia. Her father was Richard Crook. Her mother was Helena Mary Ann Powley. After the wedding, Howard and Evelyn went for a month-long trip to California. When they returned, they stayed in Glencoe Lodge. 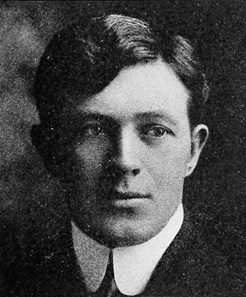 In 1913 and 1914, Howard was the president and managing director of the Canada West Development Company. In 1913, the Vancouver directory said that he was living at Glencoe Lodge. From 1914 to1918, he was at 2204 Stephens Street (although the 1914 directory says “2264”). In 1915 he began his long career with the Confederation Life Association, which lasted until about 1946. 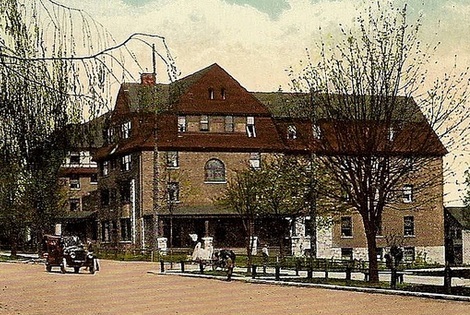 In 1916, his address was “Stanley Court,” at 920 Bidwell Street. In 1919, he moved to 1102 Gilford Street, where he stayed until 1938. Howard died in Vancouver on October 17, 1956. Evelyn died in Vancouver on January 28, 1960. Howard and Evelyn had the following children. Maurice Howard Farrant, Honours in Mathematics. Rowing; Ice Hockey, The Totem, University of British Columbia yearbook, 1933, http://www.library.ubc.ca/archives/pdfs/yearbooks/1933_totem.pdf, page 11. Maurice Howard Farrant was born in Vancouver on May 21, 1912. After he graduated from the University of British Columbia in 1933, he worked with the Confederation Life Association until 1948 (except for the period from 1942 to 1946, when he served with the Canadian military during the Second World War). He worked as an actuary in Canada and in the United States. In August 1940, in Toronto, Ontario, he married Susan Mae Hislop (often called “Mae”), who was born on August 20, 1915. Maurice died in Blaine, Washington, on May 12 1988. Mae died on September 20, 1990. John P. (“Jack”) Farrant was born in British Columbia (probably in Vancouver), about 1914. Jack was married to Lila Smith Wood (1914-2014). “Ontario Marriages, 1869-1927,” database with images, FamilySearch (https://familysearch.org/ark:/61903/1:1:FMNP-ZH3 : accessed 2 August 2015), William Farrant and Clara Hahndorf, 26 Sep 1878; citing registration , Toronto, York, Ontario, Canada, Archives of Ontario, Toronto; FHL microfilm . “Canada Census, 1881,” database, FamilySearch (https://familysearch.org/ark:/61903/1:1:MVFY-YHC : accessed 2 August 2015), William Farrand, Mitchell, Perth South, Ontario, Canada; citing p. 35; Library and Archives Canada film number C-13271, Library and Archives Canada, Ottawa, Ontario; FHL microfilm 1,375,907. “Canada Census, 1891,” database, FamilySearch (https://familysearch.org/ark:/61903/1:1:MWG9-VFK : accessed 2 August 2015), William Farrant, Mitchell, Perth South, Ontario, Canada; Public Archives, Ottawa, Ontario; Library and Archives Canada film number 30953_148165. “Canada Census, 1901,” database, FamilySearch (https://familysearch.org/ark:/61903/1:1:KHG3-DT3 : accessed 2 August 2015), William Farrant, E, Perth (south/sud), Ontario, Canada; citing p. 5, Library and Archives of Canada, Ottawa. “Recensement du Canada de 1911,” database, FamilySearch (https://familysearch.org/ark:/61903/1:1:276K-6FN : accessed 2 August 2015), William Farrent, 1911; citing Census, Perth South Sub-Districts 1-33, Ontario, Canada, Library and Archives of Canada, Ottawa, Ontario; FHL microfilm . “Canada Census, 1881,” database, FamilySearch (https://familysearch.org/ark:/61903/1:1:MVFY-YHZ : accessed 2 August 2015), Clara Farrand in household of William Farrand, Mitchell, Perth South, Ontario, Canada; citing p. 35; Library and Archives Canada film number C-13271, Library and Archives Canada, Ottawa, Ontario; FHL microfilm 1,375,907. “Canada Census, 1891,” database, FamilySearch (https://familysearch.org/ark:/61903/1:1:MWG9-VF2 : accessed 2 August 2015), Clara Farrant, Mitchell, Perth South, Ontario, Canada; Public Archives, Ottawa, Ontario; Library and Archives Canada film number 30953_148165. “Canada Census, 1901,” database, FamilySearch (https://familysearch.org/ark:/61903/1:1:KHG3-DTQ : accessed 2 August 2015), Clara Farrant in household of William Farrant, E, Perth (south/sud), Ontario, Canada; citing p. 5, Library and Archives of Canada, Ottawa. “Recensement du Canada de 1911,” database, FamilySearch (https://familysearch.org/ark:/61903/1:1:276K-6FJ : accessed 2 August 2015), Olga Farrent in entry for William Farrent, 1911; citing Census, Perth South Sub-Districts 1-33, Ontario, Canada, Library and Archives of Canada, Ottawa, Ontario; FHL microfilm . “Ontario Deaths, 1869-1937 and Overseas Deaths, 1939-1947,” database with images,FamilySearch (https://familysearch.org/ark:/61903/1:1:JDGN-X8W : accessed 2 August 2015), Olga Hohndorf Farrant, 12 Dec 1915; citing Mitchell, Perth, Ontario, yr 1915 cn 25615, Archives of Ontario, Toronto; FHL microfilm 1,862,173. “Ontario Births, 1869-1912,” database with images, FamilySearch (https://familysearch.org/ark:/61903/1:1:FMD9-HY3 : accessed 2 August 2015), Howard Farrant, 14 Apr 1881; citing Mitchell, Perth, Ontario, Canada, registration number ; FHL microfilm 1,845,576. “Ontario, Births and Baptisms, 1779-1899,” database, FamilySearch (https://familysearch.org/ark:/61903/1:1:XLRT-GY1 : accessed 2 August 2015), Howard Farrant, 14 Apr 1881; citing Mitchell, Perth, Ontario; FHL microfilm 1,845,576. “Canada Births and Baptisms, 1661-1959,” database, FamilySearch (https://familysearch.org/ark:/61903/1:1:F22H-FX6 : accessed 2 August 2015), Howard Farrant, 14 Apr 1881; citing Mitchell, Perth, Ontario, 14 Apr 1881, reference item 1 p 189; FHL microfilm 1,845,576. “Canada Census, 1881,” database, FamilySearch (https://familysearch.org/ark:/61903/1:1:MVFY-YHD : accessed 2 August 2015), Howard Farrand in household of William Farrand, Mitchell, Perth South, Ontario, Canada; citing p. 35; Library and Archives Canada film number C-13271, Library and Archives Canada, Ottawa, Ontario; FHL microfilm 1,375,907. “Canada Census, 1891,” database, FamilySearch (https://familysearch.org/ark:/61903/1:1:MWG9-VFG : accessed 2 August 2015), Howard Farrant, Mitchell, Perth South, Ontario, Canada; Public Archives, Ottawa, Ontario; Library and Archives Canada film number 30953_148165. “Canada Census, 1901,” database, FamilySearch (https://familysearch.org/ark:/61903/1:1:KHG3-DT7 : accessed 2 August 2015), Howard Farrant in household of William Farrant, E, Perth (south/sud), Ontario, Canada; citing p. 5, Library and Archives of Canada, Ottawa. “British Columbia Marriage Registrations, 1859-1932,” database with images, FamilySearch (https://familysearch.org/ark:/61903/1:1:JDZZ-CNZ : accessed 2 August 2015), Howard Farrant and Gertrude Evelyn Maud Crook, 21 Feb 1911; citing Victoria, British Columbia, Canada, British Columbia Archives film number B11370, Vital Statistics Agency, Victoria; FHL microfilm 1,983,527. “British Columbia Marriage Registrations, 1859-1932,” database with images, FamilySearch (https://familysearch.org/ark:/61903/1:1:JDZZ-CFZ : accessed 2 August 2015), Howard Fanant and Gertrude Evelyn Maud Crook, 21 Feb 1911; citing Victoria, British Columbia, Canada, British Columbia Archives film number B11370, Vital Statistics Agency, Victoria; FHL microfilm 1,983,527. 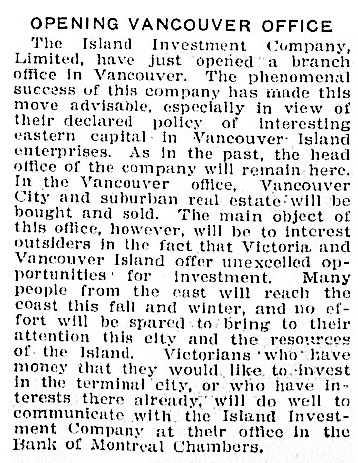 Society, Vancouver World, March 25, 1911, page 12: “Mr. and Mrs. Howard Farrant have returned from a month’s trip through California and are guests at Glencoe Lodge. “Recensement du Canada de 1911,” database, FamilySearch (https://familysearch.org/ark:/61903/1:1:QV95-9ST8 : accessed 2 August 2015), Howard Farrant, 1911; citing Census, Vancouver Sub-Districts 1-18, British Columbia, Canada, Library and Archives of Canada, Ottawa, Ontario; FHL microfilm . 1921 Canada Census, Howard Franssen [sic]; Reference Number: RG 31; Folder Number: 18; Census Place: Ward 1, Vancouver Centre, British Columbia; Page Number: 4; Ancestry.com. 1921 Census of Canada [database on-line]. Provo, UT, USA: Ancestry.com Operations Inc, 2013. “British Columbia Death Registrations, 1872-1986,” database with images, FamilySearch (https://familysearch.org/ark:/61903/1:1:FL51-ZWB : accessed 2 August 2015), Howard Farrant, 17 Oct 1956; citing Vancouver, British Columbia, Canada; British Columbia Archives film number B13229, Division of Vital Statistics, Victoria; FHL microfilm 2,033,105. British Columbia Baptism Index; Name: Gertrude Evelyn Maud Crook; Gender: Female; Event Place: Vancouver; Father Name: Richard; Mother Name: Helena M. A. Powley; Event Type: Baptism. “Canada Census, 1881,” database, FamilySearch (https://familysearch.org/ark:/61903/1:1:MV6S-KQM : accessed 2 August 2015), Richard Crook, Lytton & Cache Creek & Spence’s Bridge & Kamloops, Yale, British Columbia, Canada; citing p. 21; Library and Archives Canada film number C-13285, Library and Archives Canada, Ottawa, Ontario; FHL microfilm 1,375,921. “Canada Census, 1901,” database, FamilySearch (https://familysearch.org/ark:/61903/1:1:KHV2-CXH : accessed 2 August 2015), Gertrude Crook in household of Richard Crook, D, Victoria, British Columbia, Canada; citing p. 9, Library and Archives of Canada, Ottawa. 1901 Canada census, http://www.rootsweb.ancestry.com/~canbc/1901vic_cen/div19/d19p07.htm: “19/08/50 Crook, Helena, f, head, w, 28 Nov 1842, 59, ENG, to Can: 1847, CE, Grocer. ……Rems: RBCR: Crooks, Helena M.A., 81 y, 20 Apr 1923 at Victoria, b.ENG. DN, Times, 20 Apr 1923, p.9: Mrs Helena Mary Ann Crook, d.20 Apr 1923, 81, r.1010 Sutlej St, b.Yarmouth, ENG, leaves daus: Miss Cecilia, CA, USA; Mrs H.L. 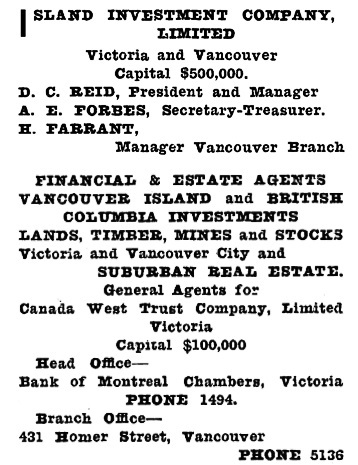 Roberts, Victoria; Mrs Howard Farran [sic], Vancouver; sons: Richard, Whitehorse, YT & Lewis, CA, USA. MR: of daughther Mary Alice (d.19, p.7, l.35) lists her parents as Richard & Helena Mary Ann. “Recensement du Canada de 1911,” database, FamilySearch (https://familysearch.org/ark:/61903/1:1:QV95-9STD : accessed 2 August 2015), Evelyn Farrant in entry for Howard Farrant, 1911; citing Census, Vancouver Sub-Districts 1-18, British Columbia, Canada, Library and Archives of Canada, Ottawa, Ontario; FHL microfilm . “British Columbia Death Registrations, 1872-1986,” database with images, FamilySearch (https://familysearch.org/ark:/61903/1:1:FLRS-N81 : accessed 2 August 2015), Gertrude Evelyn Maud Farrant, 28 Jan 1960; citing Vancouver, British Columbia, Canada; British Columbia Archives film number B13245, Division of Vital Statistics, Victoria; FHL microfilm 2,033,302. “New York, New York Passenger and Crew Lists, 1909, 1925-1957,” database with images, FamilySearch (https://familysearch.org/ark:/61903/1:1:24K2-KJB : accessed 2 August 2015), Maurice Farrant, 1937; citing Immigration, New York, New York, United States, NARA microfilm publication T715 (Washington, D.C.: National Archives and Records Administration, n.d.); FHL microfilm 1,757,755. The Graduate Chronicle, Univeristy of British Columbia Alumni Association, December 1940, volume 2, number 3, http://www.library.ubc.ca/archives/pdfs/chronicle/AL_CHRON_1940_12.pdf; page 10: marriages: Maurice Howard Farrant, Arts 33 to Susan Hislop, in Toronto, in August. Transactions of Society Of Actuaries 1988 Volume. 40, Part 2, Obituary, Maurice Howard Farrant; https://www.soa.org/library/research/transactions-of-society-of-actuaries/1980-89/1988/january/tsa88v40pt29.aspx. “United States Social Security Death Index,” database, FamilySearch (https://familysearch.org/ark:/61903/1:1:J5D3-C4M : accessed 2 August 2015), Maurice H Farrant, 12 May 1988; citing U.S. Social Security Administration, Death Master File, database (Alexandria, Virginia: National Technical Information Service, ongoing). “United States Public Records, 1970-2009,” database, FamilySearch (https://familysearch.org/ark:/61903/1:1:2M4P-TVR : accessed 2 August 2015), Maurice H Farrant, Residence, Blaine, Washington, United States; a third party aggregator of publicly available information. “Find A Grave Index,” database, FamilySearch (https://familysearch.org/ark:/61903/1:1:QVG5-8SSG : accessed 2 August 2015), Maurice M Farrant, 1988; Burial, Ferndale, Whatcom, Washington, United States of America, Greenacres Memorial Park; citing record ID 125093191, Find a Grave, http://www.findagrave.com/cgi-bin/fg.cgi?page=gr&GRid=125093191. “United States Social Security Death Index,” database, FamilySearch (https://familysearch.org/ark:/61903/1:1:J58V-L5Q : accessed 2 August 2015), Susan M Farrant, 20 Sep 1990; citing U.S. Social Security Administration, Death Master File, database (Alexandria, Virginia: National Technical Information Service, ongoing). “Find A Grave Index,” database, FamilySearch (https://familysearch.org/ark:/61903/1:1:QVG5-8SSP : accessed 2 August 2015), Susan Mae Farrant, 1990; Burial, Ferndale, Whatcom, Washington, United States of America, Greenacres Memorial Park; citing record ID 125093228, Find a Grave, http://www.findagrave.com/cgi-bin/fg.cgi?page=gr&GRid=125093228. “United States Public Records, 1970-2009,” database, FamilySearch (https://familysearch.org/ark:/61903/1:1:2M4P-TVP : accessed 2 August 2015), Susan M Farrant, Residence, Bellingham, Washington, United States; a third party aggregator of publicly available information. “British Columbia Death Registrations, 1872-1986,” database with images, FamilySearch (https://familysearch.org/ark:/61903/1:1:FL5J-QR7 : accessed 2 August 2015), Arthur Edwin Wood, 17 Oct 1955; citing Vancouver, British Columbia, Canada; British Columbia Archives film number B13225, Division of Vital Statistics, Victoria; FHL microfilm 2,032,986. Velma Campbell Docharty; Velma Campbell Docharty September 28, 1912 – March 13, 2014 Velma Docharty passed away peacefully March 13th. Survived by daughter Maureen, sister Lila Farrant, sister-in-law Nancy Cameron (Jack) & many nieces & nephews. Predeceased by husband Thomas & sister Loraine Burgess. In her 102 years, Velma lived life to the fullest. Her many stories included adventures on Bowen Island, travels & happy memories with her many life-long friends. She had a voracious inner strength & interest in everything around her. Many thanks to her devoted caregivers, Dr. Debbie Waldman, & the staff at Blenheim Lodge. She will be sadly missed but loved forever by all who knew her. – Published in Vancouver Sun and/or The Province on Apr. 5, 2014. Lila Smith Farrant; Lila Smith Farrant September 26, 1914 – November 15, 2014 Lila passed away peacefully November 15, 2014. Survived by daughter Lynne Howe, son-in-law John, grandson Shawn Warneboldt. wife Andrea and beloved great granddaughter Avery, nieces and nephews. Predeceased by husband Jack, sisters Velma and Lorraine. During her 100 years Lila loved travelling, often found in the kitchen cooking delicious meals and playing bridge with long-time friends. She had a deep love for her local mountains, picnics on the beach and drives around Stanley Park. Many thanks to the staff at Blenheim Lodge. She will be sadly missed but always remembered in our hearts. Published in Vancouver Sun and/or The Province on Nov. 22, 2014.